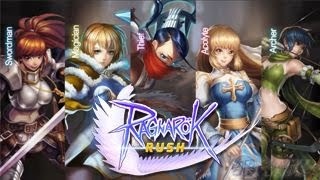 Here's some tips for beginners playing Ragnarok Rush, a RPG mobile game based on the famous MMORPG Ragnarok. Join forces and create a team with the world of Ragnarok as the creatures and pets fight alongside you, pledging their loyalty to you as their leader and to save the world! Which Job Class To Choose? Please note that you may go for any class as long that you know how to upgrade or enhance their strengths and mitigate their weaknesses. Recommendations below are based on the estimated resources that you might need to hit their potential. - In this game, you need to heavily upgrade your tank as you go, so that he won't die easily. 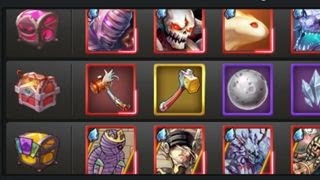 So, resource wise, tank is a good pick for F2P players. - Odin's Summon contains a lot of ranged pets and very few tanks (note: other melee pets are DPS type), so it's good. - Swordsman's skills focuses on survivability, and can protect other units. If timed right, "Provoke" can really reduce Boss damages, as well! - Your Fallen Bishop that is given for free from rewards is one of the few most used 14 Potential Pet that you can max out until end game! Recommended pet for F2P players, nice for survival modes. - Some game modes are a bit challenging because of lower overall DPS. This is where you should start upgrading your DPS Pets. - Would still need a decent AoE healer for harder stages or modes. - Also recommended for F2P players. - With a decent tank, Acolytes can support with healing skills to make em sturdier. - Can also support the whole team with buffs and heals, pretty good against AoE attacks and backstabbers. - Same with the Swordsman, some game modes are a bit challenging because of lower overall DPS. - Would still need a stronger tank for higher stages or modes. - These are ranged DPS type classes, and are really strong once you are able to create a team around them. Mages specializes on Magic attacks, while Archers on Physical attacks. - These units are placed at the back, so you can just focus on gears first that would increase their damage output. - Recommended for experienced players. - You need to invest on your tank to help your main character cast skills with ease, and a strong healer to keep your tank alive at higher stages. - Melee DPS unit that can deal massive damages if done right. Can also target units at the back which is a huge advantage since most teams have units with weaker overall defense placed behind their tanks. - Recommended for advanced players. - Thief class in my opinion is the most challenging one because aside from his or her own armors and weapons, you also need to invest on a sturdy tank to protect the front, and a strong AoE healer to heal your team. Complete Gateways and Get 5 Stars! - Quickly spend your overflowing Energy by completing all stages that you can. Collect all Stars to get all stage rewards. Make sure to open all chests, especially those 50 star chests. - Unlock new stages and gather materials needed to promote your main character and pets. - Collect and Summon new pets as you go. - If you can't complete all 5 Stars, just continue and try to at least finish that stage to move on. - Once you complete Prontera, you'll be given a nice free Pet, add them to your core team until you can get a better one with higher Potential rating. - The Swordsman class will get Succubus (magic based mage). - All classes except Swordsman will also get Goblin Leader (main tank). Just use your Poring as temporary tank until then, no need to enhance anything, just give em some decent gears. - Great place to farm materials for upgrading or crafting gears, card shards, and pet shards. - Farm according to what you need at the moment. - For Cards, go for the stats that will enhance your main character, and core team. Focus here once you get some decent purple gears at least. - Master the Ruins and collect all pet shards from rewards, this way you'll be able to get another Pet with 14 Potential rating! Fallen Bishop (magic based mage; highly recommended to max) for Swordsman. Eddga for other classes (I would recommend Goblin Leader still until you get Turtle General, Eddga is more like an off-tank with great control skills early game). - Only complete what you can, then return when you get stronger. - For Pet shards, farm and summon what your teams lacks or need to be improved like Tank, DPS (long ranged, melee, single target, AOE, physical or magical), Support, or Control. - Check the Pets section in-game for more info about them, use their icons as guide. - Tip: At higher stages, you can also farm all Pets with 14 and 15 Potential, so it is better to wait until you get there. - Tip: Check your main character's collection requirements for Pets that you should get. Click on the Collection section below your character's portrait. - Recommended To Get: Moonlight Flower to also increase HP by 50%, and also aim for 18+ Potential Pets. - After summoning or if one of them is currently in your team, continue farming to enhance (increase stars) them further with dupes. - TIP: Overall, Pets (especially Potential 15 ones) that you can farm from the Ruins are pretty good once they get more Stars. Good for creating custom teams for Trials for example. - Go to your "Bag" > "Shards" > Select a Card Shard you want to farm > Use > Confirm Drop. - Combine cards here once you are done. - Build a team around your main character. - 1 Tank, 3 DPS type units (melee or ranged), and 1 Support Healer. - 1 Tank, 2 DPS type units, 1 Control (can stun, freeze, silence, or debuff enemies), and 1 Support Healer. - For DPS units, get at least 1 AoE attacker. - Some bosses or tanks are tough because of resistances, so also consider getting at least 1 Physical based DPS and 1 Magical based DPS to your team, add more if you need backups. - Using 2 tanks is also ok, but make sure you have enough firepower, healing, or decent gears. Better concentrate on a single tank first if you are a beginner. - Basically, tanks should be placed in-front then your other melee units to the sides. Long ranged units should be placed anywhere behind your tank. - Switch your healer and/or tank to a DPS/Control unit for other modes that you don't need healing and/or tanking. - You should replace 10 Potential Pets as you go. - You may use any 13 Potential Pets for now, until you get stronger ones from Odin Summons, or by farming Pet shards. - TIP: All 13 Potential Pets can be obtained as FULL PETS as you go through the adventure mode (from treasure chest rewards; except for the exclusive ones). - Succubus (Swordsman Only) = AoE Magic attack; Silences enemies; Easy to complete Bonus MATK+% from Collections. - Goblin Leader (All Except Swordsman) = Nice early game tank; Easy to complete Bonus HP+% from Collections. 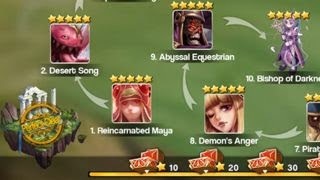 - Angeling = Excellent Healer; Gets free stars/shards from rewards which is great! How to Spot a Nice 13 Potential or any Pet? - Usually, F2P players will use them early game until they reach a certain number of Diamonds in the God of Wealth event or Point Rank Event. - Now, the best and easy way to spot a strong pet is to check their Collections info under their portrait art (click to view info). This will tell you which Pets are good depending on your current Pets. If you can complete a collection (no need to be in a party), that pet will get that bonus stat. - Skills with extra effects are also good, but would still depend on your playing style. - Owl Baron = Decent unit with AoE magic attacks+self buff. - Mistress = AoE Physical Attack; Reduces Attack Crit Reduction stats of enemies. Good for Physical based teams like Archer or Thief class that uses criticals. - Wanderer = Decent melee DPS unit, can be obtained early on. - Golden Thief Bug = Nice AoE damage at melee range. - Strouf = Strong single target long ranged magic attacks+freeze. - Nine Tails/Dark Frame = Bow users alternative to Mistress. - Baphomet Jr./Atroce/Khalitzburg/Raydric = Physical attacks+effects; Easy ATK+15% bonus from collections and another ATK+15% if you have certain 14 Potential pets. - Other Support Type pets including Deviling are also ok, but very situational. - These units are still good as fillers for other modes early game. For example, when you are up against those Cats from Trials, you don't need a tank and/or a healer, so go full attack mode and use single target pets instead. - Get Blue gears from stages and upgrade them to 1~2 Stars early game, slowly upgrade to purple then yellow gears. - Level up and upgrade their skills until around Lvl 30~40 (or until you get better units from Summons for example), go higher for core pets like Angeling. - For Promotions, go until Blue+2 or Purple (temporary pets until you get better ones). Go higher until Orange+ for core Pets, like Angeling as main healer, Goblin Leader as main tank, or any preferred 13 Potential pet above until you get better ones. - Ignore their Enhance and Skill Trees for now, unless you can get their Shards for free, like Angeling. - Learn how to coordinate combos to maximize damages. If possible, your best damager should go last to obtain maximum combo bonus. - Most of the time, bosses will use their 1st Special Skill once you are able to reduce their HP to around 50%~75%, or after doing a number of attacks. - Learn how to keep your tank alive until the end, either through survivability or by dealing fast damages. Timing is key here when using skills. - Sometimes, it is best to take out enemy tanks fast, then use their ranged units for charging up all SP for the next wave (except maybe for Thief class). - Control skills will not work on bosses, but stat reductions will. - Melee units will attack units that are directly in-front of them, and will only move to a different row if there are no valid targets in-front that is within their attack range. - Shield type units have shorter reach so they will most likely get attacked more than your "Melee Attackers" under same row. - Not all melee units have splash attacks, most of them can only attack 1 target at a time. - When using AoE skills that needs to be dragged, just check the shadow of the enemies for easy targeting. - Ranged units will always attack the nearest target, unless when using special skills. - Will get filled every time your character or pet attacks, gets attacked, or able to last kill an enemy. Bonus SP will also be given between waves of enemies. - Tasks that you must complete everyday to get more Character EXP for your main unit (orange bottles). - This will also increase the cap for your Pet's Lvl. - Resets at: 8PM (GMT+8). Most resets like number of tries or challenges will also follow here. - Eden Group (Events Section): Once you are done with all newbie stuff, a new event will appear that you can complete everyday for more rewards! - Go to camps and look for NPCs with (!) above their head. - You can check the world map for notifications regarding uncompleted quests, chests or ruins. - If you can no longer get 5 Stars or even complete a normal stage, just go and upgrade your team. - Check the events section and claim all rewards that you can here. If you want to get stronger asap, you really need to be active and join all events to get all possible rewards. - Achievements, Power Reward, and Level Gift Events are limited time events for newbies, so complete all tasks that you can before they expire. More events will come so watch out for them. - Complete to level and get more bonus stats with various rewards like Diamonds. - Palace Garden: Place your top Pets here to get better rewards over-time. - Check your Mail and other notifications (upper left corner) for global rewards! - Catch to obtain +60 Energy. - They won't go away though once they spawn, but they don't stack. - Usually appears at around: 9AM; 12PM; 1AM; and 3AM (GMT+8). Re-login if it doesn't appear. - Go to the Chat > Community then Add Friend. - For friends that are no longer active for at least 5~10 Days, you may delete them from your list to free up space. - Gather berries from Guild Wars (3x a day), aim for rank 1 to get 120 energy. - Click on the [+] next to your Energy count to buy Energy using Diamonds (2x for non VIP). - There are so many ways to earn Diamonds here, just go with the flow, complete all events that you can, and earn from rewards. - Quickly increase your Diamonds early game by using this feature under the Events section (if still available for newbies). Obtain the required Diamonds and roll until at least 6,888 (F2P) or 18,888 (easier for new servers or for VIP). - Note: First Charge Reward will give you a Moonlight Flower pet for free! - Optional: Use your Diamonds for the x10 Summon to get a random Full Pet. Ideally, a pet that is suitable for your Main character or team. - Point Rank Event: Use the Summons from these events to get points. Score and grab the highest ranks to get high Potential Pets! If you are able to draw Evil Snake Lord, that's a big bonus! - Also check other offers exclusive to VIPs or "semi whales" for available Pets. - Just do a x10 Summon once or twice to get a full pet, then wait and complete the remaining x1 Summons to get another 1 full pet after a few days. - The higher the potential of Pets that you can get, the better, but all of them are pretty good early game. - If you are able to draw Evil Snake Lord, that's a huge huge bonus for you as F2P VIP0 player! - Drawing more is optional, but better save your remaining Diamonds for crafting gears, getting cards, or for other events. - Point Rank Event: If you want to aim a rank here, the best way is to earn at least 16k~20k+ Diamonds first, then if you are lucky enough, you can try to snipe the 1st, 2nd or 3rd rank, 1 or 2 minutes before the event expires. Remember to use the event page when summoning. If the other players are way ahead before you can even start, better save your Diamonds and try again next time or grab the 4th~10th rank to get some Infinity Shards. - Summons will accumulate some points, and can be exchanged for Pet shards. This is also a great way to get specific pet shards! - Turtle General = For non Swordsman class job, get this asap as your 15 Potential tank (also farm shards from other sources like MVP Challenge). Replace Goblin Leader (use rebirth from craft menu to release pet, use 200 Diamonds if it's heavily upgraded). - Get any Pet that is needed to complete your main character's Collections, then your core Pets. - By default, non-VIP players can purchase up to 240 Energy for 100 Gems. - Do this everyday once you run out of Energy or if needed, to quickly advance through the game or to farm items like Pet/Card shards, upgrade/crafting materials, and more. - Invest here once you have a nice core team, and need more boost. - Watch out for discounts as well and use these opportunities! 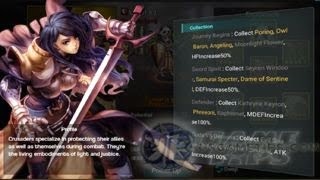 - Some gears can be farmed early game, but for Purple or higher grade gears, you need to craft them. 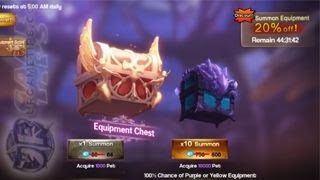 Using x10 Summon will guarantee you a Golden Hammer and a Purple Gear. Check crafting section for more info. - Each summon will give you points which can be used to purchase weapons or crafting materials from the Exchange Shop. - Full Yellow and Red Cards can be obtained from Card Boxes (x10 Summon). Each summon will give you points which can be used to purchase more cards from the Exchange Shop. - Aside from the Shop, cards can also be farmed from the Ruins. Check Event Achievements for more freebies. - Still optional and depends on how heavy their upgrades are. This will give you up to 100% of your resources back. - Example: If you have a heavily upgraded Goblin Leader and want to transfer the materials used to your Turtle General, your new main tank. - Example: If you want to transfer the upgrades of your heavily upgraded Yellow Weapon (will get destroyed though) to your new Red Weapon without farming the required materials again. - Once you are able to unlock the first one (Megingjard), you may start enchanting to increase it's stats. The Transmit feature can be found in your main character's stats screen. - Use the "Epic" option as Rearing method to increase effectiveness. - Don't forget to save before exiting. - The first roll will only require 1 Diamond, which is great if you have limited pets. If you need to roll more, the next ones requires 20 Diamonds. - To unlock more chests from your Faction Assets, you'll need to spend some Diamonds (resets per day). - To get these chests, your faction must conquer any Field Mines or World Mines first. - I would highly recommend getting chests that contains crafting materials early game, aim for those hammers! - There are some methods that are also good, but it will require you to get a VIP account, or at least a VIP player to maximize effects. Example: For resetting Gateways to farm more shards per day. - Only when needed to complete a task. Click on the "+" button next to your Gold. - Optional: If you want to farm more Arena Mark points for the Arena Store. - Used to draw more rewards at higher stages to get more Red Scale Shards, Friendship Medals, and higher chance to get crafting materials like Golden Hammers. - If you want to farm more Honor points, you can reset the Gateways for 500 Gems. Recommended at higher Lvls to maximize output (at least Lvl 15 or higher). - For upgrading skills, and to pay fees like Promotions, Enhances, Equipment upgrades and more. - This is where most of your Gold will go, upgrade your Guild's Lvl and it's features to increase their potential and effectiveness. - Donations will also give you some Guild hearts which can be used to purchase items from the Guild Store. Example: 100 = 200 Guild hearts. - Would recommend getting those Shard Boxes for quick Promotions, or those Pet/Card shards depending on what you currently need. - Nice method for farming Oridecons and Eluniums. 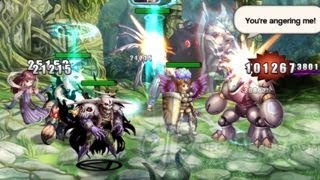 - Use the x10 Summon to get 1 guaranteed Pet for your collections. This is also a good way to complete tasks that requires you to have a number of Pets.